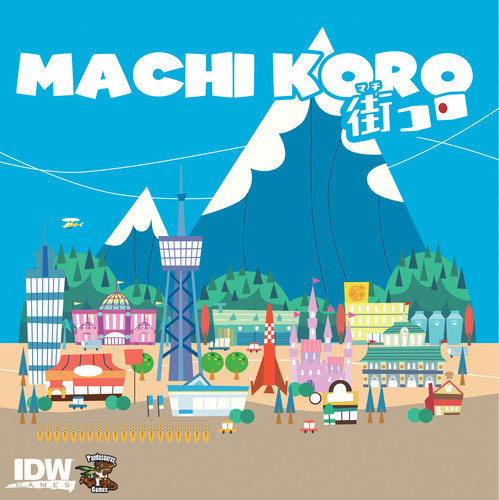 Machi Koro is a fantastic tableau-building game, where you compete to be the first to build the attractions that will make your city the best! On a player's turn, they roll a die and compare the result to their tableau. If those cards have the same number at the top of the card, they activate, giving the player gold and other benefits. These cards also may have triggers on other players' turns! Using this gold, players may buy more cards for their tableau, giving them more opportunities to earn gold in the future. The trick to Machi Koro is deciding how to build a card engine. Will you focus on Ranches in the early game, then move to Cheese Factories to bring home huge profits in the endgame? Or will you grab every Restaurant you can and steal away the hard-earned money of your opponents? All of these options and more make this an excellent opportunity to try out a new strategy every game. After only a few games, the Harbor expansion becomes necessary to add some variation to this game! With new attractions and plenty of new businesses, Machi Koro and the Harbor Expansion will find its way into plenty of game nights.